To promote sports in the 2nd Asian Indoor Games competition program to the public, the Macao 2nd Asian Indoor Games Organising Committee (MAIGOC) is hosting a promotional program at the Macau Tower today (21 July) with the exciting performances of Extreme Sport athletes. Aside from winning Games souvenirs at the activity, there will also be photo opportunities with 2AIG Mascot “Mei Mei”. Also, exhibitions for the 2AIG will be displayed at various scenic spots, to introduce history of the Asian Indoor Games, including the bidding process, 2AIG logo, mascot, competition schedule and venue, to enforce deeper understanding of the Games. Different sports demonstrations will be held in the Macau Tower on every weekend between 21 July and 18 August on the following performing days: 28 July, and 4, 5, 11, 12, and 18 August. 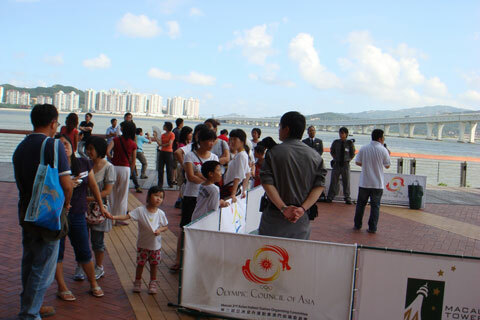 Public are welcomed to participate in the upcoming Games activities to be held by MAIGOC.